Cet article aborde le problème des reconstructions actuelles de théâtres anciens, s’appuyant sur les exemples du Globe de Shakespeare à Londres et de l’École d’escrime à Gdańsk. Ces deux projets de reconstruction, l’un achevé avec succès, l’autre en cours, représentent deux approches différentes du passé architectural. Le théâtre londonien cherche à reconstruire non seulement les conditions physiques du Globe original, mais également son atmosphère et ses techniques scéniques, créant ainsi une machine qui invite le spectateur à voyager dans le temps. De cette manière, le théâtre et sa scène deviennent une condition sine qua non du spectacle, qui ne peut être représenté nulle part ailleurs. L’exemple de Gdańsk, conçu par un architecte italien, Renato Rizzi, choisit une approche différente : plutôt que de créer une reconstruction fidèle, l’architecte a proposé une « boîte à trésor » métaphorique, qui fait écho à l’architecture traditionnelle de la ville, mais reste en fait un splendide exemple d’architecture du xxie siècle. À l’intérieur de cette boîte, équipée d’un « couvercle » qui s’ouvre, se trouve le « trésor caché » : une délicate structure en bois d’un théâtre du xviie siècle. Au lieu d’un voyage dans le temps, l’espace de ce théâtre se concentre sur le présent et sa relation avec le passé. En plus de la scène en éperon, le théâtre contient deux autres types de scènes, la scène à l’italienne et l’arène. The article deals with the problem of present-day reconstructions of old theatres, using as examples Shakespeare’s Globe in London and the Fencing School in Gdańsk. The two reconstruction projects, one successfully completed, the other under construction, represent two different approaches to the architectural past. The London theatre aims at reconstructing not only the physical conditions of the original Globe, but also the atmosphere and the staging techniques, thus creating a time-machine, which invites the spectators to a voyage in time. In this way, the theatre and its stage becomes a sine qua non of the performance, which cannot be staged in any other surroundings. The Gdańsk example, designed by an Italian architect, Renato Rizzi, takes a different approach: instead of creating a faithful reconstruction, the architect has proposed a metaphoric "treasure-box", which echoes the city’s traditional architecture, but is in fact a splendid example of a 21st century design, and inside the box, which is equipped with an opening “lid” or roof, is the hidden treasure – a delicate wooden structure of a 17th-century playhouse. Instead of a voyage in time, the space of this theatre concentrates on the present and its relationship to the past. Apart from the thrust stage, the theatre contains two other types of stages, the box-stage and the theatre-in-the-round. 2But staging the city does not only mean that among other buildings and institutions in a given city there are theatres in operation. The cities have become an important part of the lucrative aspect of the economy, and an engine for employment, growth, vitality and revitalisation.3 The city itself may metaphorically be viewed as a stage where various sets explicated by all sorts of historical and contemporary plots, narratives of the past and the present, are staged before an audience which is not a chance audience: people come to see parts of the city on purpose. Thus location becomes a destination. Moreover, the attractiveness of the city is often estimated on the basis of the variety and quality of whatever the city is capable of staging. A major role in this relatively new phenomenon of creating new identities, often connected with re-writing history, is played by theatres of all kinds, ranging from the ancient Greek amphitheatres to old cinemas converted into commercial playhouses. People come to watch a play staged in what seems to be true historical surroundings, so the focus is not necessarily on the play as such, but on the architecture and the interior design of the building, perhaps a combination of the two. 3When a historical building is reconstructed, it seems as if two temporal and spatial structures are being blended and staged. One is the material edifice, which comes into being in our present time and is real in the physical sense; the other is the fictional past which is inscribed into the building, resulting from the role attributed to it. The latter is done in a complex manner, reminiscent of stage acting. The city tells stories about itself, always set within preselected elements of the cityscape, which result in various historical narratives, depending on the selection and combination of the stories. The narrative of the city may be propagandist in nature, educational, commercial or artistic, or a combination of the four, depending on the choices made by those in power and the goals set before them. Architecture, both old and new, private, municipal and industrial, provides the key code to the city’s identity. Buildings become signs of narratives, signs of the past, the present and the future. 4When talking about theatres, it may be observed that the theatre itself – as a building or any other kind of space in which a performance takes place – will usually emphasise its otherness and also lead us to a correct deciphering of what constitutes its interior and sometimes also of what we can see on the stage. This brings us to the basic question: do theatres as buildings have meaning? If the answer is yes (and I am inclined to think so), then it follows that the external shape and the significant physical space of the auditorium may be the components constituting our understanding of the spectacle: we watch the play through the prism of the meaningful “text”, or ideological/iconographic programme of the theatre building and of its interior. What follows is that even the same performance will generate different meanings when staged in different spaces. Stuart masques, for instance, gained specific meanings when staged in Inigo Jones’s Banqueting Hall, where the ceiling, painted by Rubens, presented an iconographic image of Stuart ideology which the masques corroborated.4 In the ideological and iconographic programme of Whitehall Palace, its space was identified with the Temple of Wisdom, Peace and Honour. In George Chapman’s Memorable Masque (1613), the Temple was in fact presented scenographically on the court stage – in this way the mythological and allegorical space of the court appeared in a rare example in theatre history as the space of the theatre staging itself. So, the narrative of the palace found its continuation and corroboration in the masque staged. In this way, the palace staged its own ideology. 5It may be pointed out that there have always existed theatres of two kinds or orientations: those with exteriors and/or interiors that carry a “message”, or even a whole ideological programme independent of whatever performance is staged within their space, and those which do not carry any specific meaning, except as a permanent or temporary acting area. Its function is the only meaning. Our basic concern in this context is whether and to what extent the building and its interior become part of the performance. This space not only creates the atmosphere and provides the physical conditions for the performance to take place but can also refine, explain, negate and influence the receptive processes. It can provide an ideological context, which prompts the spectator how to read the performance text. It is therefore possible to distinguish theatre buildings and interiors which are independent of the performance, and those that are complementary and integrated with them. Consequently, this enables us to distinguish theatres in which triple relatedness may be observed (the staged spectacle vs. ideology of the theatre and its interior vs. the empirical reality outside) and theatres with dual relatedness (the staged spectacle vs. empirical reality) only. The first of these will usually characterise those theatres arranged in buildings that were either occasionally used for theatrical purposes, like Romanesque and Gothic churches, or were part of a more complex architectural structure, like all sorts of banqueting halls and theatres in royal or ducal palaces. Buildings originally designed as theatres quite often reveal a conspicuous ideological programme that can influence the perception of a performance, as is the case of class-oriented edifices, aristocratic, bourgeois or working class. Occasionally these will have an ideological programme revealed in the architecture and design of the interior which carries an educational or propagandist meanings (“temples of culture”, “high-society”, “people’s theatres”, “underground theatres” and the like). In practically all these interiors, the space of the auditorium is separated not only from the artistic realm of the performance, but also from the physical space outside. The iconography of royal or ducal palaces was often a reflection of the then-current ideological programme of a given dynasty, and was usually designed to mark a rigid boundary between the semi-divine and super-human world of the palace and the ordinary human world outside. The space and time/lessness of these interiors, inhabited by superhumans, are often separated from the space and time that govern the mundane lives of ordinary humans. Thus, a performance staged in a space meaningful in itself is bound to create relationships and meanings peculiar to that space and the circumstances of the actual spectacle. In other words, the fictional realm created during the performance will inevitably be related to both the space of the theatre and the world outside it. 6The second type of relatedness, that of a dual nature, will predominantly characterise all those theatres which were originally designed to serve a specifically theatrical function and do not dissociate themselves from the outer reality. In many of those theatres the time and space of the auditorium is part of a larger whole, of empirical reality. Thus, we may distinguish two extremes of theatre spaces. One is oriented towards itself, and allows for a limited variety of performances which will tend to contribute to and complement the meanings of the interior, and, in this sense, this introverted theatre might be labelled autotelic: the primary function of performances staged in that kind of theatre will be to corroborate or elucidate (or both) the meanings generated by the theatre building and its interior.5 Because the other extreme is semantically neutral, without significance, it is extraverted in character, and oriented towards the outer world and towards an infinite variety of plots and meanings. The first type may be exemplified by some historical cases of court and bourgeois theatre, but above all is manifested by the Christian church-as-theatre; the other kind is evident in all types of “poor” theatres, of which the Spanish corrale de comedias and the London theatres of the period between 1567 and 1642 are perhaps the best known manifestations. In the case of reconstructions, however, it may be observed at this point that the original context is not and cannot be reconstructed, even if the reconstruction is carried out in minute detail. What this means is that the original context is suspended, altered or even annulled, and a new one provided, which may transform the theatre of one type to another, of the two types distinguished above. The space that is unintegrated (the original Globe) is converted into an integrated one (present day Shakespeare’s Globe). 7As I have already pointed out, an important role in city story-telling is played by reconstructed or refurnished theatres. It is not only because a historical monument is reconstructed, but one must not neglect the fact that the new building is given a new function that it never had. In many ways a reconstructed theatre, which is designed to revive the past in our present, assumes the metaphorical role of an actor and puts on its historical costume, and thus becomes a sign of the past brought into the present of the inhabitants or visitors to the building. It becomes a sign of something it is not. And in this sense, we may talk of theatricality6 and fictionality and of the theatre building being staged as if in a performance. We enter a space in which at least two time scales are in operation: the real present of the building in its usually new surroundings and always in a fluctuating political, social and economic context; and the fictional past-in-the-present which the building stages as a sign that is basically iconic, denoting a specific edifice set in its original context (the latter cannot be retrieved or reconstructed, and may only be imagined). This is why, among other reasons, reconstructed buildings create a theatrical atmosphere. It may be said that in the material substance of the building a layer of fictionality is inscribed, creating meanings that were not part of the original,7 because the original was not a historical monument and it was not a reconstruction. It also functioned within its original, hence contemporary, context, which was not historical at all. Thus, the semantics of reconstructed buildings is conspicuously different from that inherent in the original; they both tell different stories. This results in the specific performativity of architecture, which is staged in a historical costume for modern audiences.8 This inevitably changes the semantics not only of the building as such, but also of whatever is staged inside. 8When we talk about theatricality or performativity we usually use the words in a metaphoric sense.9 But in this particular case it seems that indeed the stage itself and the theatre building are being staged, even though they are not necessarily a theme park, but a live artistic institution. What exactly do we mean, when we say that something is being staged in a theatrical manner? Well, it seems that the basic criterion of what “theatrical” means is the layer of fictionality that is inscribed in a human body and objects, and that is predominantly generated by acting. Since the latter may be seen as the art of creating fictional time, it is obvious that objects cannot act by themselves; they need a human agent to do that. Why? Well, because on their own they cannot pretend or signal they are somewhere else at a different time. So, how can theatres as pieces of architecture act? They cannot, but with the help of a human agent they can in fact become a part of the performance, a part of the material signifiers denoting fictionality.10 This is done through the actor’s ability to transfer the created fictional time on to the objects around him/her. In order to confer a new temporal dimension on the objects, the actor does not have to describe the process verbally: it is sufficient that he/she looks at something, touches it or points to it. Through this, objects are transferred from the real time of the performance to the fictional time of the created world. There is no reason why the process could not include the stage and the whole theatre building. Naturally, this needs further explanation, because this is the feature of all monuments of the past: they all become signs of some historical moment or period. But we must not forget that theatres are special, because during a performance, through the agency of live actors, a miraculous thing happens: the past is brought back to the present and begins to flow in a recreated stream of time, which shares the present time with the present of the spectators. For in theatre we are dealing with a dual present time, the real one and the fictional one. And, as I intend to show you, the reconstructed theatre building reveals the ability to insert itself into this dual stream of time. This means that during the performance, the theatre plays an active role, and strengthens the ability of the space to bring the past into the present. 10The present day Shakespeare’s Globe has evoked both great enthusiasm and criticism, the former is evidenced by the popular audience, as shown by the ticket sales, educational success, and by the fact that the theatre instantaneously became one of the major tourist attractions in today’s London. The area around the Globe theatre now boasts of five hotels, clusters of restaurants and pubs, the Millennium Bridge for pedestrians, linking the theatre with the City, and hundreds of new luxury flats. The whole area has been changed beyond recognition. The nearby Tate Modern has attracted more than five million people in 2006, and has maintained that level until today! The criticism has come from artistic circles and from some theatre critics. In recent years academics have entered into the discussion, and a number of publications have appeared in which an attempt is made to tackle the topic from a serious academic perspective. So, critics talk about a “Shakespeare factory”, “a theme park”, which claims to be of Shakespeare in new ways, but in fact is tourist-dependent and sells a mediated experience of the past in the present, etc.12 The line of reasoning and discussion, however, is not entirely satisfactory. What is missing in the ongoing controversy is a more theoretical approach, which would explain what exactly it means to stage a production in a reconstructed building.13 In what does it differ, if at all, from productions staged in “ordinary” theatres? What exactly do we mean when we talk about the performativity of a theatre? This is what prompted me to write this paper. 11In order to explain the problems involved in a more theoretical manner, one needs to observe that generally in theatre, fiction is constructed due to the physical presence of a live actor, who may be seen as a biological clock on the stage, and due to his or her changed deixis, by which a fictional role is assumed.14 In other words, the actor signals that he/she is to be interpreted or read not as him/herself any longer, but someone or something else, and that the newly created fictional figure lives in a different time and a different space, appearing to us in a fictional stream of time, whose present overlaps with the real present time of the audience and the performers. Moreover, the fictional time and space, signalled by the actor, may be transferred on to other objects and phenomena appearing on the stage, and this is done through ostensive signals generated by the actors on the stage. Through the actor’s words, gestures and gaze, a spatial and temporal contiguity, or indexical relationship, is established between the fictional figure and its time and space and the real objects and phenomena on stage. In this way, a layer of fictionality may be superimposed on the materiality of the whole theatre. In certain circumstances the whole theatre, and not only the stage, may become a stage set. And this is exactly what happens in reconstructed playhouses. The implication of all this is that it is predominantly the task of the actor to attribute temporal and spatial (usually fictional) dimensions to the space around him or her. Since the space in a reconstructed theatre is in its physical appearance and function similar, if not identical, to what we know about the historical space of the original stage, the usual conspicuous inadequacy of its physical attributes of the phenomenology of the stage is avoided. The fictional Elizabethan actor, played by a live actor from the twenty first century, is surrounded by a space that may have been similar or even the same four centuries ago. 12The Elizabethan stage in its unchanged physical appearance was used for productions of different plays, which means that the material context for sundry productions remained virtually the same. The architecture of the stage is isolated from the productions staged in the sense that it does not create meaning of its own. It is a semantic chameleon, constantly changing its meaning, due to its ability to absorb meanings from acting. The Elizabethan stage does not have a meaning of its own other than functional; it does not have an ideological programme, apart from being a place for staging plays. Thus the deciding factors in the generation of meaning are predominantly the words and the actors’ bodies with their various configurations. The latter, i.e. the actors’ bodies, are the only space required for the words to gain a theatrical dimension, the effect of theatricality (and, of course, some basic functional space, a platform stage, a tiring-house and an auditorium are needed for the actors to perform). From this perspective, the space of the performance is limited to the physicality of the actors and the fictional spaces denoted by the language and acting. This implies that the words’ immediate, material context and reference is the space of the actors’ bodies, which generate and transfer meanings on to the materiality of the stage space. This further implies that the space of the stage and its physical appearance are to be transparent, if not invisible. What counts is the actor’s body and his/her behaviour and utterances. Thus the physical shape of the stage is not an inseparable component of the performance text. Since scenery was not used, the stage remains the same for different productions. The same material signifier is used to convey totally different and unconnected meanings. This also means that the same production may be presented on a different stage of this or similar kind, without a significant change in its semantics and aesthetics. It may be performed in a street, a town square, a school yard or a lecture hall. This means that the relationship is one-sided, or isolated, i.e. the stage, like a sponge, absorbs fictional meanings, constantly changing, from the words and bodies of the actors and does not contribute to the meanings by its specific physical appearance. This explains why Elizabethan productions could be presented in other public spaces, which were not necessarily constructed as theatres. All that was needed was the functional arrangement of the platform and the tiring-house, with at least two entrances on to the stage.15 Thus, the production as such is limited in its substantial and spatial appearance to the language and human bodies. As I said, this can be presented anywhere, from an inn to a hall in a nobleman’s house. To the Elizabethan audiences the materiality of their theatre was to remain invisible, transparent, if not meaningless. 13However, in the case of integrated productions, which in most instances use scenery and artificial lighting, to create a spatial context for a particular production, the stage set is totally integrated with a given play, and cannot be used for any other production. Similarly, when the theatre is reconstructed to host productions linked thematically or stylistically to the building’s historical origin, the relationship is not isolated, but integrated, because the theatre building, the interior design and the stage become an inseparable part of the performance. This seems to be the case with Shakespeare’s Globe in London. The meaning generated in reconstructed theatres is significantly different, and this cannot be achieved in any other space. In other words, productions in reconstructed theatres are site-specific and are integrated with the architecture of the stage. The latter is not invisible; on the contrary – it plays a leading role. The productions prepared for Shakespeare’s Globe cannot be taken outside this particular theatre without a significant loss of their meaning and aesthetics. They are conducted in very close relationship to the architecture of the theatre and the physical conditions of the stage, which today are historical, and this historicity generates all sorts of meanings that are relevant to today’s audiences. Thus, quite contrary to the original productions at the Globe, which were isolated, today they have become integrated. This also shows how different they are, even though – unlike its predecessor - the theatre is dressed in a faithful costume of history. The theatre as a signifier denotes not only various fictional spaces, but – much more than its predecessor – draws attention to itself. 14Now, it may be said that if the goal is to create a performance as if it were taking place in the original building, then it seems that it is not only the live actor who creates the indexical relationship with the materiality of the building, but also the fictional figure. And in this particular case, the fictional figure is a fictional Elizabethan actor. This is not a well-known and described phenomenon, so it needs further explanation. In an “ordinary” theatre, when an actor assumes a role and inscribes in his/her body and through his/her utterances a fictional figure, we, the spectators, understand that what we see as the material substance of the stage simultaneously becomes a sign of something it is not. It may become a sign of a meadow or a mountain peak, or an underwater kingdom. We understand that we are expected to read the materiality of the stage and the stage set as signifiers denoting something that in our objective reality they are not. This rule, typical for theatre as such, is somewhat altered in the case of reconstructed stages, in which seemingly reconstructed productions occur. The reason for this is that the present day live actor assumes a dual role: first is the role of a fictional actor, living in the historical past, and performing in the historical theatre, and second is the role that that fictional actor assumes in the fictional theatre. Thus, the spectator is capable of noticing that the real actor is behaving (acting) as if he/she were a fictional actor in the original theatre, which implies that part of the information conveyed by the acting is oriented towards achieving that particular aim: to signal that at least some part of the acting is determined by the unique physical conditions of the stage, and the unique theatre as such. Thus it is not only the theatre that constitutes a historical reconstruction, but, at least partly, the performance itself. Through the first role, the real actor assumes the deixis of the fictional actor, who, although belonging to the past, is not somewhere else: he/she is on the stage of the original theatre, doing his/her job. Through this, the fictional actor establishes spatial and temporal contiguity with the visible space of the stage and with the particular theatre, and not with some created and implied theatrical space. For the fictional actor, the stage on which he/she performs is not historical, but contemporary. Since the physicality of the live actor seems to coalesce with the physicality of the fictional, say, Elizabethan actor, the illusion is created that they are one. Whom we see is the Elizabethan actor shown at work. Through this the fictional time of the actor, playing, say, in 1610, is to be treated as the real one. The implication of all this is that it is predominantly the task of the actor to attribute temporal and spatial dimensions to the space around him or her. Since the space in its physical appearance is similar, if not identical, to what we know about the historical space of the original stage, the conspicuous inadequacy of its physical attributes is avoided. Both the live and the fictional Elizabethan actors are surrounded by a real space that may have been the same four centuries ago; hence the sensation of sameness. 15Thus an illusion is created, by which the fictional time of King Lear is expected to be juxtaposed with the time of the actor playing him, i.e. an actor from 1610, which, as indicated, is another fictional figure, and not a live human being. The latter is an actor performing in 2010. Hence the goal of productions of this kind is to create an illusion of a historical performance, and not in the usual ways in which theatre creates meaning. Instead of becoming invisible or transparent, the stage and its physical appearance become foregrounded and play an important role in the generating of meanings: like a stage-set they are to be visible throughout the show in order to remind us constantly that this is not a simple production of King Lear, but a production set in the original staging context. And it is in that context that King Lear was and is staged. So, a significant part of the performance’s meaning is the stage and the theatre, where it is shown, along with the costumes, style of acting or even the phonetics of verbal utterances. We are to perceive the performance as if it were taking place 400 years ago. This is corroborated by the behaviour of the spectators, who are prompted to behave as if they were the Elizabethan audience: they move around in the yard, they hiss the villain, cheer the army and interact with the actors. 16An additional effect is that the time and space of the actor become split. In theatre, the denoted fiction is juxtaposed with the ontological material reality. Here, the idea is that we juxtapose fiction to yet another fiction, that of a fictional Elizabethan or Jacobean actor. In this way, the material space of the stage is expected to create an indexical relationship with the time and space of the fictional actor, and thus becomes the Globe theatre of 1610, creating an illusion of a historical space, which, in turn, becomes a conventional signifier for the space of the world of King Lear. Thus, the stage, in its material appearance, and actually the whole theatre, takes part in the performance, not of King Lear, but of a reconstructed historical performance of King Lear. What follows is that the stage and its particular elements function as dual signs: on the one hand they denote the material stage and theatre of the past, and foreground their conventional usage in the time of Shakespeare, while on the other they are the material substance of stage signifiers denoting whatever elements of the fictional Lear world. This explains why we are justified in talking about performativity. 17Of course, a conscientious spectator will understand that the live actor is assuming a double role: not only does he/she play King Lear, but he/she also plays an Elizabethan actor playing King Lear. In this way, the materiality of the stage cannot disappear: on the contrary, the actor and the director will constantly remind the spectator that this is not a production of King Lear, but a production set within a specific historical space. Thus, the production is not only about the story involving King Lear, but in a conspicuous way it is also about the theatre building itself. Consequently, we are not expected to treat the pillar on the Elizabethan stage as the signifier of, say, a tree in a wood, by which, with the help of our imagination, the pillar may disappear, but as a materially highly inadequate signifier characteristic of the Elizabethan stage, by which the pillar should not disappear, because it is also a sign of the historical staging conventions of the Elizabethan stage. The pillar remains the pillar, but the one set on the Elizabethan stage. In other words, we are expected to perceive the performance as if we were watching the original production, or as modelled according to historical rules and conventions. But this is an impossibility, because this is not the way the original production was perceived. Here lies the gist of the matter. This is why we may speak of performativity. The theatre plays its own role in the production: it is set in a fictional time and is dressed in a historical costume, assumes a role of something it is not. It is a material signifier denoting its own predecessor. This inevitably leads to an illusion or its opposite – the estrangement effect, making the spectator suspect that the whole is created to mislead or even fool him/her into believing that he/she is watching a performance from four hundred years back. 18Thus, the architecture and the design of the stage gain the function of a stage set, a piece of scenography that establishes the inseparable setting for the performance and not for the fictional realm of King Lear. The latter becomes a secondary meaning. For the real actor, the space around him/her is a historical space, with which he/she tries to identify, or set him/herself in, whereas for the fictional Elizabethan actor the space around him is contemporary, and does not denote time past. This implies that it is the performance that is staged, and not only King Lear. The performance is staged along with the theatre building. The performance becomes totally integrated with the architecture. The spectators are invited to a time machine, which takes them back to 1610. The voyage through time becomes the major attraction, as in an amusement or theme park. Since this is repeated in every production of different plays that are staged at the Shakespeare Globe Theatre, it becomes repetitive, hence predictable. This explains why some people raise objections concerning the artistic side of these productions. No matter which play is staged, a significant part of the meaning is connected with the theatre as a historical monument and with the staging techniques and conventions, which people are led to believe are historical. Thus, instead of a performance, we may talk of a display. The theatre is staged or displayed, as in a museum. This, of course, might remain the goal in itself, a major tourist attraction, but might also be considered an artistic confinement and may change with the appearance of different attitudes and conscientious directors who would free the theatre and its stage from their function as a universal scenographic set. In point of fact, the most recent productions at the Globe have shown that new directors have appeared who, given all the architectural confinements, are at pains to create new spaces, hence to liberate the theatre from its performativity effect. 19Volumes have been written about the historical Globe theatre and its present-day reconstruction. For this reason there seems no need to discuss all the architectural details and the rudiments of the Elizabethan stage. A lesser known example of an attempt to “reconstruct” an old, Elizabethan in style theatre comes from Gdańsk. Even though I have written extensively on the subject of the historical theatre and its cultural context (connected with the continental activity of English players in the first half of the seventeenth century), the design accepted for the construction is not widely known. Built in around 1611, constructed anew in 1635, it functioned as the city’s only public playhouse for over a hundred years. The idea of having an Elizabethan theatre reconstructed in Gdańsk, strange though it sounds, did not appear out of the blue, but is well grounded and justified in the city’s cultural history. 20It so happened that the playhouse was built during the period of Gdańsk’s “golden age”: Gdańsk was not only Poland’s largest city (being part of the so-called Regal Prussia, which was a Polish province, contrary to Ducal Prussia, which was an independent duchy), but a true metropolis on the Baltic. Remains, or rather distant echoes of the glorious past may be admired even today, thanks to the reconstruction of the old town almost totally destroyed during the war; however, it is worth remembering that at that time Gdańsk’s income was larger than the income of the crown, and that the kings of Poland were often in debt with Gdańsk merchants and bankers who, among other things, financed the Italian opera at the Royal Castle in Warsaw.16 Gdańsk was also at this time supporting Poland’s military missions, providing monies or equipment or both. In this fortunate period of its history, the combination of Gdańsk’s wealth with the rule of well-educated and open-minded councils, bore fruit in the form of an unprecedented growth of the city’s culture beyond comparison with that of any other city in the whole of Poland. 21Any description of the Gdańsk renaissance would not be complete if we did not mention the appearance of English acting companies that started visiting the city in the early seventeenth century. The scope of this phenomenon, evidenced in the first half of the century by at least thirty documented visits, leaves no doubt that the players’ activity was not incidental or sporadic.17 It has to be stressed at this point that these companies were composed of professional actors most of whom had started their careers in the London theatres. We may give many reasons for the actors’ continental peregrinations. One is provided by Rosencrantz in Shakespeare’s Hamlet: this was the competition of the children’s companies; another was the tendency to create a sort of theatre monopoly in London and the persecution of Catholics which forced some actors to leave their homeland. As a result, a number of actors became unemployed and consequently, starting in the 1590s, sought fortune beyond the seas. First reconnaissance visits were apparently successful, because after the turn of the century we witness a growing activity of English companies on the Continent. It has to be stressed, however, that performances in cities were usually restricted to certain seasonal events; in Gdańsk this was the time of the St. Dominic Fair (in August). So the main goal to achieve for the actors was permanent patronage at a ducal or royal court. The companies were “strolling” by necessity and not by the actors’ love of travel or by their attempt to promote culture in out-of-the-way corners of Europe. It is indeed difficult for us to imagine all the hardships and dangers of travel in the sixteenth and seventeenth centuries, especially in winter time. 22It so happened that English players found bounteous patrons at the ducal court in Koenigsberg and the royal one in Warsaw.18 As a result, they could spend the winter in those courts, and travel in the summer to perform in Gdańsk or Elbląg (during the Thirty Years’ War Poland, which remained neutral, became the major centre of English companies’ activity; thus Poland was also the only country on the Continent where that activity continued for more than half a century).19 Travel in the countries engaged in the war was simply impossible and finding patronage was not very likely in agreement with the ancient truth that inter arma silent musae. Ill. 1: Peter Willer, Der Stadhof, 1664-1686. 24It may be added that the architectural details and dimensions of the Fortune theatre are known from the builder’s contract, which has luckily been preserved.22 As a detailed analysis has shown, in its dimensions and proportions, the contract almost perfectly matches the Gdańsk engraving. Moreover, two contemporary accounts tell us that the capacity of both theatres was if not the same then similar: both sources mention 3000 spectators; this also implies that the theatres were similar in size and probably in architectural detail.23 As I have already mentioned, the Fencing School in Gdańsk functioned as the city’s only permanent playhouse for approximately a hundred and thirty years, and it hosted on its stage many companies from different European countries. When the English players disappeared from the scene, they were succeeded by actors from Germany, Russia, Poland, the Netherlands and also from Italy (in 1646 an Italian opera was staged in Gdańsk: to my knowledge this was in fact the first public performance of an opera north of the Alps!). In many ways the Gdańsk theatre is also a monument to the changing styles and trends in European theatre history. 24 Jerzy Michalak, “Był sobie Gdańsk”, nr 3(6), wrzesień 1998, pp. 20-21. 25 A Particular Description of the City of Dantzick, (London 1734), p. 20. 25The sources for the Fencing School, both written and pictorial, are meagre, to say the least, although comparable to the evidence there is for the London playhouses. However, in recent years scraps of evidence have been added. For instance, in 1998 a ground plan, uncovered by Jerzy Michalak, was published, on which the Fechtschule is clearly marked.24 This shows a regular square, with galleries surrounding an inner yard (also square). Even though the scale of the building seems slightly smaller than the one visible in the Willer engraving, it goes without saying that these two are one and the same structure. This is the building described in 1734 by an anonymous English writer as similar to “amphitheatres” and used also for animal baiting: “a large Are[n]a for Baiting of Bulls, Bears and wild Beasts, Amphiteatre-like, capable of containing a vast Number of Spectators, strongly inclosed with Wood, and having convenient Galleries for that Purpose, one above another.”25 The fact that the Fencing School on the Willer engraving and on the ground plan of 1739 are one and the same buildings is confirmed by yet another piece of evidence, namely, by marginal notes made by M. F. Joh. Monet, a parish priest from a small town near Gdańsk, in the surviving copy of Curicke’s work.26 He also indicates that the building was dismantled in 1741 (i.e. two years after the ground plan under discussion was rendered). And the name Fechtschule dispappears from both written and pictorial evidence after that date. As is clear from later maps of the same area, confirmed by written sources, a new building was built on the site, or adjacent to it, called Comoedienhaus. As indicated above, this was dismantled at the turn of the 18th and 19th centuries when a new municipal theatre was built (which was bombed in 1945). 26Archaeological excavations, undertaken between 1997 and 2000, and again in 2004 (under the supervision of Dr Marcin Gawlicki), have revealed remains of the original building (the plot became part of the housing development built in the nineteenth century). It was a significant step forward in our study of the theatre’s history. A number of construction posts have been discovered, and dendrochronological studies gave us the date – 1632. It has to be recalled that the theatre was renovated and refurnished many a time, and we have records for significant works which took place in 1635. Also, a module was discovered, giving us the dimension of particular bays – 2.8 m, which was later used by some of the participating architects in our competition. From an introductory analysis it appears that the theatre was a slight rectangle, measuring 8 x 7 modules, giving us the dimensions of the frame: 22.4 m x 19.6 m, giving us the area of 439 square meters, which means that it was almost 1/4 smaller than the Fortune playhouse, which measured 24 meters square, which gives 576 meters. 27Thus, the Gdańsk Fencing-School is a remarkable monument of the city’s cultural history, its links with international theatrical centres, London in particular. It seems natural, then, that the idea arose of having the Gdańsk Fencing School reconstructed along with the revival of the tradition of English actors’ visits to this city. The major aim of this undertaking is to create in the reconstructed theatre an international performing arts centre, which would, on the one hand, play an important role in the Baltic region, on the other would create a bridge between the East and the West. Thus, in 1991, a group of enthusiasts started a non-profit organisation, called the Theatrum Gedanense Foundation. As a citizens’ initiative it may be seen as a symptom of the new times and new political situation in our country after 1989. The Foundation’s development and efficiency, has depended largely on the involvement of a small group of people, most of whom work on a voluntary basis, on the support of local and regional councils, and on financial backing by individuals, institutions and corporations, both Polish and foreign. It was extremely fortunate that H.R.H. The Prince of Wales kindly agreed to become the Patron of the whole enterprise in its early phase; world-famous film and theatre directors, Sir Peter Hall and Andrzej Wajda are the Honorary Patrons. In other words, it became possible to create a lobby which supports the Foundation’s activity outside Gdańsk. Two societies of friends have been registered abroad: one in Britain, where among the founding members we find Tom Stoppard, Arnold Wesker and Alan Ayckbourn, the other one has just started its operations in the USA. 28The reconstruction of the theatre is not the goal in itself: the Foundation aims at playing an active role in the city’s and region’s culture, wants to organise artistic events, both for connoisseurs and for the general public, one-man shows and festivals, concerts, conferences, along with implementing an educational programme for young people. However, the most important and largely publicised event organised so far was the “Shakespearean Week”, which after 350 years, in August 1993 – during the traditional St. Dominic Fair, and following the Royal visit of our Patron, H.R.H The Prince of Wales, revived the tradition of English actors’ visits to Gdańsk. In 1997 this annual event was transformed into a festival, and it has eventually become an international event (co-financed by the Ministry of Culture, local governments, EU and corporate sponsors). So far, the Shakespearean Festival hosted companies from over thirty countries, among others, Great Britain, Germany, France, Hungary, Russia, Japan, Lithuania, Estonia, Romania, Korea, Latvia, Cuba, Poland and Slovakia, presenting over one hundred and twenty different productions. 29The brief outline of the Foundation’s activity, provided above, was necessary for giving the cultural context of the planned reconstruction of the theatre in the Fencing School. Before the competition for the architectural design was announced in 2004, it was necessary to determine and solve a number of questions and problems connected with the future function of the building. The basic sources for the design were provided by the mid-seventeenth century engraving by Peter Willer, mentioned above, and by the Fortune contract. No doubt, the newly uncovered ground plan of 1739 had to be taken into consideration, along with the results of the archaeological excavations. These determined the basic dimensions of the structure. The galleries for spectators, surrounding the square inner yard, had to be three stories high and have dimensions similar to those indicated in the contract. But one thing remained certain to us from the very beginning: the reconstructed building had to be multi-functional, and flexible enough to accommodate productions originally designed for different spaces. The latter factor is essential for the final artistic success of the project. In other words and in spite of all the technical difficulties involved, the Gdańsk theatre had to provide three basic types of spatial arrangements: the so-called thrust stage, evoking the Elizabethan tradition, and the box-stage (proscenium arch stage), being the most common in today’s world, and the theatre-in-the-round. 30In January 2005, the jury of the international architectural competition announced its decision: the winning design was the one by Renato Rizzi, an Italian architect from Venice. Professor Rizzi questions the whole idea of historical reconstructions, though he does not reject it entirely. Renato Rizzi has taken a different approach: although in his design time remains the key factor, it is not dressed in historical costume, it does not use make-up and does not wear a wig. The theatre presents itself as a modern creation, which does not pretend to be ancient, and yet has the ability to reflect the past and comment on it (see the illustrations). However, it is not only the past of the particular building, but the past of the city. This takes the form of an architectural “treasure-box”, in which the city keeps what it considers to be most precious: in this case it is the Renaissance wooden theatre. So, the outer shell of the theatre evokes and echoes the architectural past of the city (red-brick Gothic churches dominate in the old town), which long ago was itself guarded by high and heavy defence walls and bastions, and inside this thick and heavy “box” is kept the delicate and fragile wooden structure of the theatre. So, the Elizabethan spirit of a thrust-stage and galleries is preserved, but the outer layer enters into a dialogue with the past of the city and with its contemporary shape. Three types of stages have been included: the thrust stage, the box stage and the theatre-in-the-round. In point of fact, our architect has designed all sorts of spatial arrangements of mixed nature, which have the potential of creating a great variety of spaces for sundry productions. By evoking the past, the theatre comments upon it and at the same time shapes the present.27 In this way, the building becomes the sign of architectural past and of the theatrical tradition. Thus, what is being reconstructed here are not the wooden beams and posts, but the spirit of the original theatre, where imagination was the key to the artistic success of a play, where, indeed, unworthy scaffolds may accommodate the whole world. 31And a final note: in 2010, the archaeological works have ended, the design work is finished, and the Gdańsk Shakespearean Theatre – a newly founded institution – has received financial backing from both, the local governments, and the Ministry of Culture. The groundbreaking ceremony took place in September 2009, with the participation of our Prime Minister, Mr Donald Tusk, the Minister of Culture and many other dignitaries. The ceremony was preceded by an unusual artistic event, devised by Andrzej Wajda: in the main town square, the Long Market, about eighty actors from all over Poland, performed scenes from Shakespeare’s plays on twenty-two stages. About ten thousand people came to see the actors, many of whom were television and film stars, and for one hour the spectators could move from one stage to another, as was the custom in the Middle Ages. 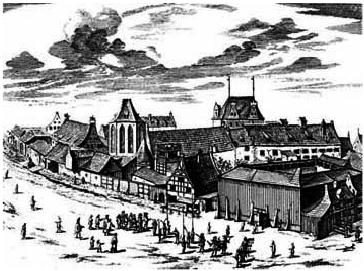 Thus, for one hour the whole city spoke Shakespeare, adding to the narrative that has continued since around 1600, when the first English players came to Gdańsk. 1 This paper is an altered version of an earlier essay, only recently published in Nordisk Drama, (Gdańsk: University of Gdansk Press, 2010), pp. 19-30. 2 Stanton B. Garner Jr., “Urban Landscapes, Theatrical Encounters: Staging the City”, in: Land/Scape/Theater, edited by Elinor Fuchs and Una Chaudhuri (Ann Arbor: The University of Michigan Press, 2002), p. 95. 3 Susan Bennett, “Universal Experience: the city as tourist stage”, The Cambridge Companion to Performance Studies, edited by Tracy C. Davis (Cambridge: C.U.P., 2008), pp. 76-90. 4 See, for instance, R. C. Strong, Britannia Triumphans. Inigo Jones, Rubens and Whitehall Palace (London: Thames and Hudson, 1981), O. Millar, Rubens: The Whitehall Ceiling (London: O.U.P., 1958). 5 Naturally, in today’s theatre practise quite often no respect is paid to the ideology or meaning of theatre interiors, and we might have an agit-prop play shown in a church. 6 Theatricality may be understood as a dual function of everything that constitutes the “signalling matter” of the performance: the phenomenological appearance of objects, bodies and phenomena on the stage along with their function and meaning usually, though not always, known to the spectator from everyday life experience and acquired knowledge, and the attributed or denoted shape, function and meaning in the fictional realm, as described and signalled to us by the actors, which are not congruous with the former. Thus, theatre relies on the permanent juxtaposition of at least two models of perceiving reality, that of the spectators and of the fictional stage figures, with the latter signalled by the utterances and behaviour of the actors. For an intriguing discussion of theatricality see, among others, Eli Rozik, “Is the Notion of ‘Theatricality’ Void?”, Gestos, vol. 15, n°30, (Noviembre 2000), pp. 11-30 and “Acting: The Quintessence of Theatricality”, SubStance, vol. 31. n°2 & 3 (2002), pp. 110-124. My understanding of theatrically is slightly different, if not complementary to Rozik’s insights. See also Erika Fischer-Lichte, “Introduction: Theatricality: A Key Concept in Theatre and Cultural Studies”, Theatre Research International, vol. 20, n°2, pp. 85-89, and Samuel Weber Theatricality as Medium (New York: Fordham University Press, 2004). 7 It is important to remember that meaning in theatre is created through the juxtaposition of the attributes of the denoted fictional realm to the physical substance and the modelling of the stage signifiers. The goal of the theatre therefore is not only to evoke or establish fiction, but also to show how that fiction is created; so, it is not a fictional King Lear that constitutes the entire meaning, but the relationship of the image of Lear evoked in the spectator’s mind to the physicality of the actor, his costume, voice, makeup, wig etc. The same applies to other components of the stage text, animate or inanimate. This also means that the assigned fictional time is always juxtaposed with the real time of human bodies and objects. The duality of everything on the stage results in what may be labelled as theatricality. 8 On practical problems connected with reconstructing past performances see Robert K. Sarlós, “Performance Reconstruction. The Vital Link Between Past and Future”, Interpreting the Theatrical Past. Essays in the Historiography of Performance, edited by Thomas Postlewait and Bruce A. McConachie (Iowa City: University of Iowa Press, 2000), pp. 198-229. 9 On performativity in the critical sense see, for instance, James Loxley, Performativity (London and New York: Routledge, 2007). 10 At this point I disagree with Eli Rozik who claims that objects and animals can act. Cf. Rozik, Generating Theatre Meaning. A Theory and Methodology of Performance Analysis (Brighton and Portland: Sussex Academic Press, 2008), pp. 78-90. 11 Cf. Jerzy Limon, “The Memory of Architecture: Renato Rizzi’s Design for the Theatre in Gdańsk”, in Shakespeare in Europe. History and Memory, ed. by Marta Gibińska and Agnieszka Romanowska (Kraków: Jagiellonian University Press, 2008), pp. 313-332. 12 See W.B. Worthen, Shakespeare and the Force of Modern Performance (Cambridge: C.U.P., 2003), pp. 79-116. 13 Naturally, our knowledge of the past is based on research by theatre historians, archaeologists etc. On the numerous problems involved with establishing the “facts” in theatre history, see Thomas Postlewait, The Cambridge Instroduction to Theatre Historiography (Cambridge, C.U.P., 2009), chapter one in particular: “Documentary Histories: The Case of Shakespeare’s Globe Theatre”, pp. 27-59. 14 This leads to the phenomenon of what Eli Rozik calls the deflection of reference (Rozik 2008: 79-82). 15 It is worth noting that the situation is different when we are dealing with a historical reconstruction of a performance from the past, or if the production is set within a space that is a historical reconstruction of a space used in the past as theatre. This is the case with Greek classical plays performed in theatres like the one in Epidauros. 16 See my “Przyczynek do dziejów teatru dworskiego Władysława iv”, Pamiętnik Teatralny, xxxii, 1983, z.3, p. 347-8. 17 Many of these have been published by Johannes Bolte in his Das Danziger Theater im 16. Und 17. Jahrhundert (Hamburg und Leipzig 1895), and some in my Gdański teatr elżbietański (Wrocław 1989) and also Gentlemen of a Company, op. cit. 18 See my articles: “Aktorzy angielscy w Elblągu i Królewcu w pierwszej połowie xvii wieku”, Komunikaty Mazursko-Warmińskie, 1-4 (183-186), 1989, s.23-31, and “Komedianci angielscy w Warszawie. Przegląd źródeł”, Pamiętnik teatralny, xxviii (1979), s. 469-477. 19 One of the most famous of English strolling players, comedian “Pickleherring” (Robert Reynolds), apparently became a star at the royal court, for after his death around 1640 his wife was given a pension by the King of Poland, which is the first recorded instance of such prolonged patronage in Poland’s theatre history. 20 First to notice the similarity of the Gdańsk theatre to the Elizabethan theatres was W. Krause in the introduction to his Das Danziger Theater und sein Erbauer Carl Samuel Held (Gdańsk, 1936). Cf. also my books on the subject: Gdański teatr “elżbietański” (Wrocław-Warszawa-Kraków-Gdańsk-Łódź, 1989) and Gentlemen of a Company. English Players in Central and Eastern Europe, 1590-1660 (Cambridge, 1985). 21 It is interesting to note that the new theatre was the initiative of and was financed by one James Kabrun, a Gdańsk merchant of Scottish descent, thus creating yet another British link in the history of theatre in Gdańsk. 22 It may be added that this particular contract was also used in the recent reconstruction of the Globe theatre in London. There are practically no pictorial sources for the interior of the Globe and as the result we are dealing with an eclectic design, where apart from the Fortune contract and the Hollar Long View of London, Johannes de Witt’s sketch of the Swan theatre also served. 23 Among the written sources we have for the London theatres the number 3000 is used twice, in each case referring to a different theatre. It may, of course, be claimed that at the turn of the 16th and 17th centuries, “3000” simply meant “a lot of people”. 26 I have had access to the xerox copy of the original, kept at the Gdańsk technical University. The original volume, containing Monet’s notes, is said to be in the collection of some library in Germany. Unfortunately, I have been unable to track it down (I hope the present article will draw to it the attention of German scholars and librarians). 27 Professor Rizzi has introduced a number of possible ways in which plays may be staged in this theatre. The space may be arranged in such a way as to become a theatre-in-the-round, it may become an Elizabethan or proscenium arch type of a stage. The impressive roof opens like the cover of a casket, allowing day-light performances as a summer option. The area on the roof and around it may also be used for artistic purposes. The main auditorium itself may have many functions. Apart from theatre, which will be technically equipped to host a variety of shows, it may house conferences, exhibitions, all sorts of artistic events, ranging from screening of films, through installations to art actions. The building will also serve a role as an education centre: art students will inevitably bring life, enthusiasm, imagination and artistic talent. Jerzy Limon, « The city and the “problem” of theatre reconstructions: “Shakespearean” theatres in London and Gdańsk », Actes des congrès de la Société française Shakespeare, 28 | 2011, 159-183.